A black and white negative of a car that has been in an accident. View is of the rear fender on the driver's side. 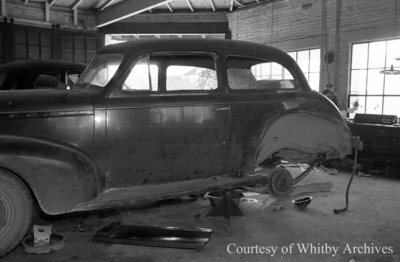 The car is inside the garage at Whitby Motors Ltd. The negative envelope indicates that this photograph is of the Beecroft car after it had been in an accident. Car Wreck, July 5, 1941, Marjorie Ruddy. Whitby Archives A2013_040_754C.